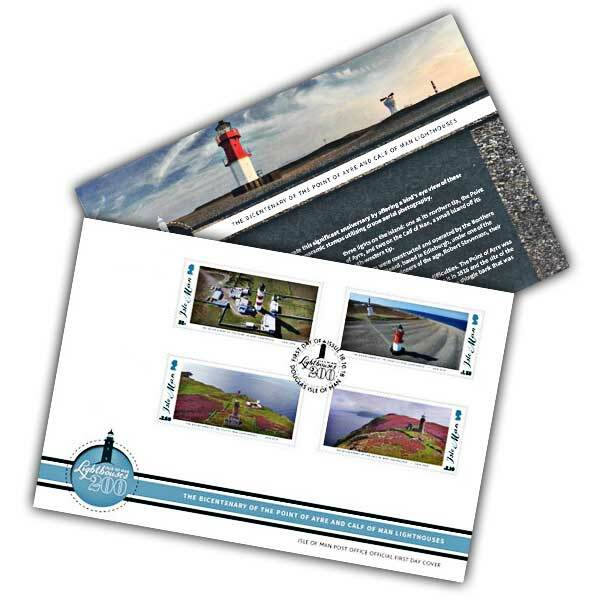 The full set of Lighthouses 200 stamps are displayed on this scenic cover and cancelled with a special postmark for the first day of issue. Enclosed is a filler card complete with text by Manx historian Charles Guard . This year, 2018 sees the 200th anniversary of the very first long-term lighthouses on the Isle of Man and they are marvels of Georgian innovation. Located in the middle of the Irish Sea, the Isle of Man provided a severe danger to 18th century ships trading in between Ireland, Scotland and England; without any lights to mark its treacherous coast in the evening it was the scene of many shipwrecks. 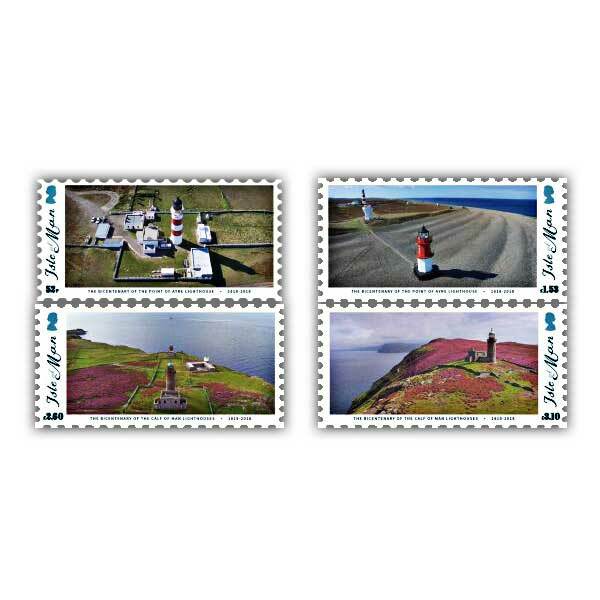 Merchants from the surrounding ports petitioned the authorities on various occasions and ultimately, in 1815, an Act of Parliament broke the ice for the building of 3 lights on the Island: one at its northern tip, the Point of Ayre, and 2 on the Calf of Man, a little island off its south-western point. The Point of Ayre was remote; there were no roadways to it in 1816 and the site of the light tower was surrounded by a big shingle bank that was gradually moving to the south east. The Calf of Man was likewise remote, and its circumstances weren’t helped by the activities of its tenant who didn't desire the lighthouses constructed. Stevenson managed to build 2 splendid lights on the Calf, each with their keepers' enclosures and homes. The 2 lights were constructed straight in line with the reef, and as ships passed, and the lights appeared straight above each other, mariners understood the reef's place and might safely pass it. Stevenson embellished the light towers with dolphins, the Three Legs of Man and other themes, quietly included into the ironwork around the light chamber windows. Today, the lights on the Calf lie in ruins. In the 1870s a rock light tower was developed on the Chickens Rock reef to mark it, and the Calf lights were switched off. The light at the Point of Ayre, however, is still in operation, though it was automated in 1993. It has its initial Fresnel lens from 1890 and it shows 4 flashes of white every twenty seconds. The tower now has a distinct daymark of 2 red bands and is among the renowned structures of the Isle of Man.